Donald Trump delivered a speech in Warsaw Thursday morning, but it will be studied far more carefully in Berlin and Moscow. 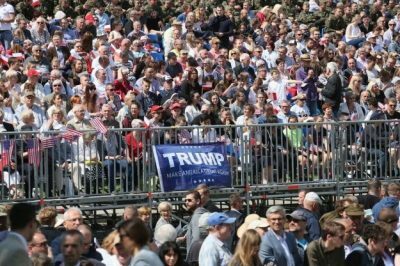 So hostile was the population of the Polish capital to the visit by the US president that the ruling (Law and Justice) PiS party, which shares Trump’s outlook of semi-fascistic nationalism, had to bus in supporters from the rural areas to make a respectable—and suitably enthusiastic—crowd. The speech touched several bases required of any US president, and particularly Trump, battered by months of allegations by the intelligence apparatus and media—aimed at pushing him to take a more aggressive stance against Moscow—that Russia intervened into the US presidential election to favor his candidacy. He reaffirmed, in categorical fashion, the obligation of the US government under Article Five of the NATO charter to respond militarily to any attack on any member of NATO. Trump had previously cast doubt on the possibility of the US going to war with Russia, a potential nuclear cataclysm, in response to a border clash in Estonia, Lithuania or Latvia, the three Baltic republics ruled by viciously anti-Russian right-wing governments. Article Five does not cover Ukraine, which is not a NATO member. The most important passages in the speech, drafted for Trump by his foreign policy team and delivered without any obvious deviations, declared sympathy for the plight of Poland, trapped geographically between more powerful nations, Germany and Russia, sometimes partitioned or overrun by them. The speech was delivered at the site of a memorial to the Warsaw uprising by the Polish Home Army in 1944, which was bloodily suppressed by the Nazis. Trump himself knows next to nothing of the geography or history of Poland, or any other country, for that matter. These lines were undoubtedly prepared for him by the National Security Council and fascistic aides like Stephen Bannon, and the clear purpose of the material was to fan the flames of anti-German and anti-Russian sentiment, both in Poland and more broadly in Europe. This is in keeping with the new orientation of US foreign policy, which regards the European Union as a major economic and (potentially) strategic adversary dominated by Germany, and therefore makes common cause with the EU members most antagonistic to Brussels—first of all Britain, which is pursuing Brexit, and secondly Poland, which has repeatedly clashed with the EU over the ultra-right and antidemocratic measures of the PiS government. Trump deliberately associated himself with the viciously anti-immigrant policies of the PiS, claiming that, like his own administration, the government in Warsaw was not persecuting immigrants but rather fighting terrorism, which both Trump and the PiS identify with the Muslim countries and Muslim minorities in Europe and the United States. Actually, Europe is a largely secular society, and Poland is a relative backwater with its powerful Roman Catholic hierarchy and priest-ridden rural population—the price paid for decades of persecution of socialist and left-wing thought by the Stalinist bureaucracy. There was a definite anti-Semitic subtext in the speech, thinly disguised by a perfunctory one-sentence reference to the Holocaust and the extermination of the Jews of Poland. But there was no mistaking the undertones of an address that hailed the Polish people, their culture and religion—the word “Polish” appears 25 times in the seven-page text of the speech—and makes exactly one reference to the Jews, and no mention of anti-Semitism. In addition, Trump did not visit either the memorial to the Warsaw Ghetto uprising or the recently opened Museum of the History of Polish Jews, honored as the 2016 European Museum of the Year. The evocation of “will” as the decisive category is significant. It is not for nothing that Leni Riefenstahl’s propaganda film on the German Nazi Party’s 1934 congress in Nuremberg was given the title “Triumph of the Will.” Trump may not know, but Bannon certainly does, the fascist pedigree of this particular piece of right-wing rhetoric.